We’ll walk you through all of the steps of getting your dental implants so that you have the best experience possible. Dental implants have changed the face of dentistry. Unlike most other restorations, dental implants look and function just like natural teeth – so you can bite, chew and speak with ease. Now that people have recognized the many benefits of dental implants, the procedure is becoming commonplace. In fact, this year alone more than one million dental implants willbe placed. The vast majority of patients experience no problems with implant surgery. You can expect that your new teeth will be virtually indistinguishable from natural teeth – both for yourself and others. However, as with any surgical procedure selecting the right doctor is a key factor in getting an outcome you can smile about. Implant placement generally requires several office visits. Your actual course of treatment will depend on your specific needs. Another factor is whether your doctor can handle all aspects of your treatment under one roof. 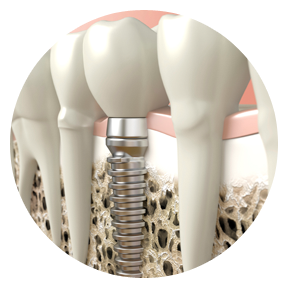 Standard implant placement is generally a two-stage process. Call Artisan Dentistry at either our Salem, NH office or our Newburyport, MA office for your implant consultation today. Dental implants look and function just like natural teeth – so you can bite, chew and speak with ease.